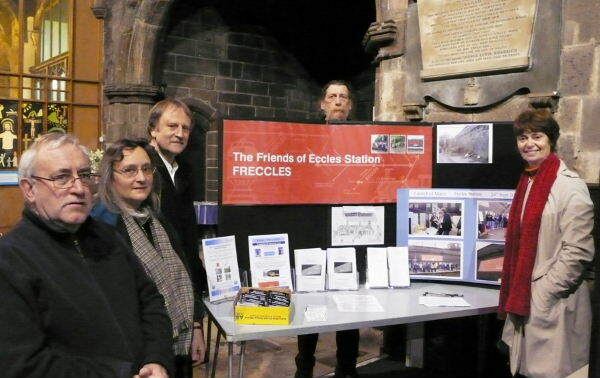 Members of Freccles were invited to meet the Bishop of Manchester, the Right Rev'd Nigel McCulloch, when he arrived at Eccles Station on the 16:01 from Manchester Victoria as part of his pilgrimage visit to Eccles on Friday 16th November 2007. 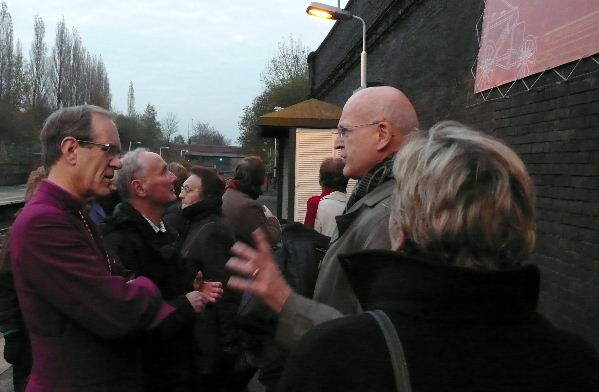 We took the opportunity to show the Bishop the work we have been doing as a group with the garden area and the Discover Eccles mural. Bishop Nigel was very interested in the work we have been doing and the fundraising we have achieved, including our success through the O2 'It's Your Community' fund bid. We thank the PCCs of St Andrew's & St Mary's Parish Churches for giving us the opportunity to meet with their distinguished visitor and to Bishop Nigel for giving us his patronage as an honorary member.